A.N. Original Jewelry: Meet My Baby: Vemelope Sweetie Pie Lover Lamb Chop aka "Mel"
Meet My Baby: Vemelope Sweetie Pie Lover Lamb Chop aka "Mel"
I'm back! Forgive my tardiness, I was always late for homeroom in high school and looks like nothing has changed now that I'm blogging. Sometimes I just plum forget! Anyway, Meet my pride and joy, my very first baby girl, Vemelope Sweetie Pie Lover Lamb Chop, or "Mel" for short :) Although her name is quite long, it is actually much longer in reality, but this is her "official" name. We've also added Melvin, Melito and Drumstick to her name unofficially. 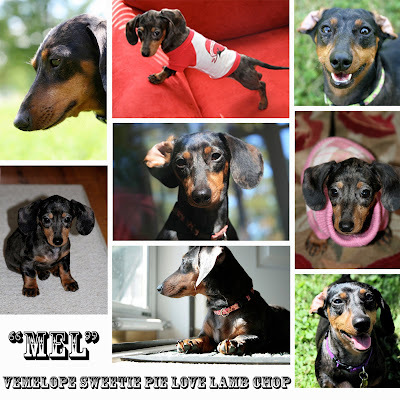 Mel is a little ball of personality in the form of a Dapple Miniature Dachshund. She is a cuddle bug, a comedian, a champion ball chaser, and clumsy chipmunk chaser. Mel was my very first baby, I got her just a couple weeks after Christmas, January 8th 2007 to be exact! It was love at first sight, and my entire family quickly became just a smitten with Mel as I was. In fact, we often argued over who was going to cuddle with her, or nap with her. Mel is the perfect napping buddy, even my teenage brothers couldnt resist Mel's cuddle charm! Aside from being the cutest thing EVER, Mel has quite the personality. She quite enjoys kisses on the cheek and presses her face up to your mouth to kiss her repeatedly. If you decide you've had enough, she will tell you otherwise and shove her face on to your mouth again. There's only one thing in the world that Mel loves more than kisses, and that is belly rubs. She pretty much dives at your feet and rolls over anytime she meets someone new. Mel also LOVES eating apples! But she eats them like a human, she holds them in her tiny paws and eats a whole apple all the way around the core. Now when I go Apple picking in the Fall, I make sure to get lots of tiny "Mel-sized" Apples. Mel also can be a bit of a diva, in fact she HATES wearing any sort of clothing. She gets really depressed and embaressed and hides or lays her head on your shoulder and pouts until you take it off. So, I hope you enjoy a few of these snapshots of my pride and joy, as I have to scurry off and take my little Melvin for a walk as she's been patiently waiting at the door, with leash in mouth, waiting for her morning walk. Toodles! Awww!!! I love her in the pink sweater, lol. And I'm so glad you posted! She's so cute! I wanna squish her! I love the pic with both of her ears folded back! lol! Congratulations! She looks like a character. OMG! It makes me want another one! I have a Dachshund-Chihuahua mix, and he's the greatest dog EVER! He loves to kiss me, but it has to be on the lips. Just adorable! I love wiener dogs!